While prowling the dreaded Xbox Live indie marketplace in search of the handful of decent games that exist in there like a jaded administrator rummaging in the stationary cupboard, I spotted two that looked ok from their screenshots. They seemed 3D-ish, they were categorised as shooters, and the quality of the visuals in the stills was pretty good for XBLI games. Both titles began ‘House of…’ and both came from the same developer. Why sample only one risky proposition when you can gluttonously wolf down two? House of Cockroach (240 MSP) and House of Spice (80 MSP) reintroduced me to a genre I’d almost forgotten about: the lightgun game. The canny reader might have spotted a small problem here – a lightgun game without a lightgun. Anyone who’s tried that before knows how fiddly and frustrating it can be to drag a little reticle across the screen with a controller. The ‘House of…’ games are designed to be that way. I started with House of Cockroach. As the screenshots suggest, the visuals are pretty good for an indie game. They’re not going to blow anyone away, but a lot of XBLI graphics appear to have been created in MS Paint, so the attempt at detailed and contoured objects is appreciated. 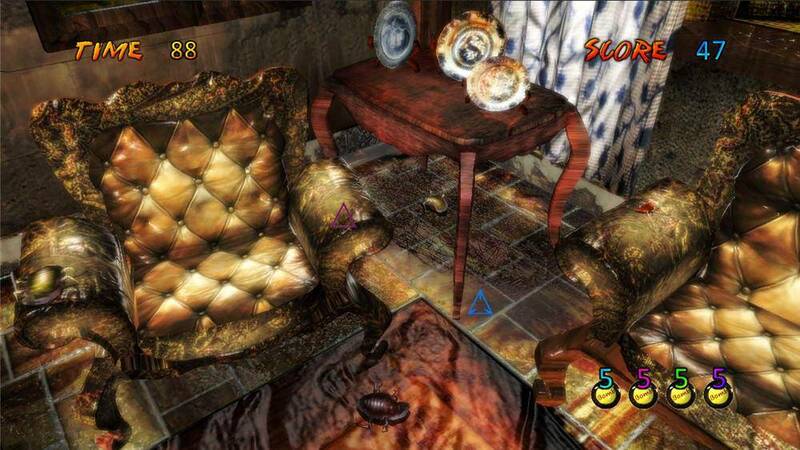 The furniture in the infested house would shame an N64, which isn’t something many indie titles can boast. Unfortunately, the game plays like being asleep. Have a seat. Don't mind the bugs, I'll spray some green liquid at them until they explode. There are two weapons, each assigned to a trigger. One is called ‘machine gun’ but actually sprays green mist (possibly bug spray); the other is called ‘reflect gun’ and fires little blue spheres. The reflect gun is pretty much useless, since the spheres take a moment to reach the target. The machine gun spray thing is much more effective. That’s pretty much everything interesting I can say about House of Cockroach. The rest of it is all about just being moved from position to position (in the manner of a traditional lightgun game) while spraying bugs that wriggle as though dancing to the dreary soundtrack. It took me a few minutes to realise why the game was so boring, though. Then when I wasn’t particularly paying attention to shooting the bugs, it struck me. If I didn’t shoot them, nothing happened. They just wriggled off. House of Cockroach, it turns out, is missing something vital for its genre. Pedigree lightgun games like Time Crisis and Virtua Cop have traditionally been tense and challenging affairs. Enemies bursting out unexpectedly from ignored corners to shoot you in the face with pinpoint precision lend a certain urgency to proceedings. In House of Cockroach, though, there’s no danger. Enemies wriggle onto the screen, then if not shot they wriggle off again, going about their business. The weapons don’t even have magazines, so even the tiny hint of challenge or tension that might have come from timing your reloads correctly is drained unceremoniously away. With enemies that just want to be left alone and weapons that can be fired endlessly, there’s really no point to any of it other than to get the highest score you can. Playing House of Cockroach was so tedious that tedium itself got bored and went to the pub. On to House of Spice, then. Like its insect-themed counterpart, it’s a lightgunless lightgun game. Fortunately it’s the better of the two in most respects. For the first couple of minutes, I actually had something approximating to fun. Not a lot of fun – probably about as much as you’d have with a flash game on your lunch break – but still more than the complete vacuum of fun in the previous game. 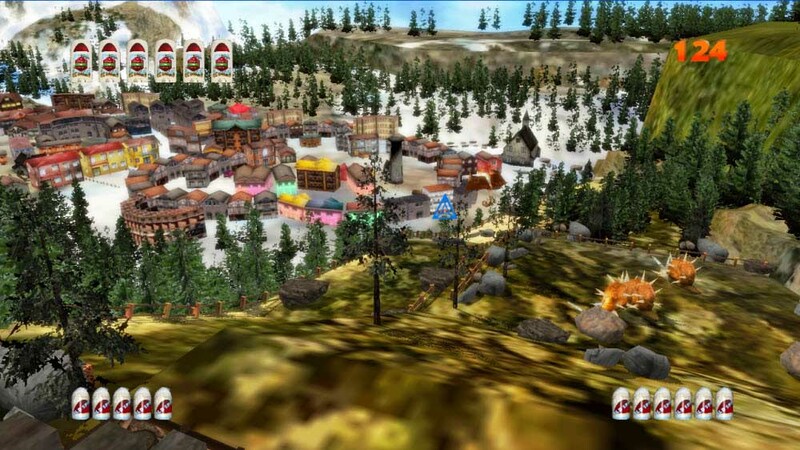 The setting here is more interesting, presenting us with a small town in the mountains rather than a room in a gloomy house. The enemies are strange, including both giant snails and flying seahorses that spit balls, which makes a pleasant change from repetitive insects. A few of the enemies actually attack, and although there’s no health meter it is entirely possible to die. Behold yonder peaceful hamlet! Behold its thorn'd snails the size of cars! The reloading problem from House of Cockroach has been amended too, in that now the two ‘spice guns’ with which you shoot the apparently randomly chosen enemies have to be reloaded from time to time. It never really impinged on the gameplay that much, but ensuring that I didn’t run my guns dry at the wrong moment at least added a little more interest. There are also a few collectibles scattered around, though they don’t seem to serve any purpose. Unfortunately for House of Spice, it’s still not much fun. The reticle is an inconspicuous shade of blue that tends to blend in against most of the backgrounds, and when a camera shift causes a change in these backgrounds it’s easy to lose track of it entirely. At one point it took me a good thirty seconds to find the reticle again, since even firing my spice guns didn’t leave much of a mark to help me out. On top of this recurring problem, House of Spice goes on far too long. I died just a few seconds short of the eight-minute time limit imposed on indie trial games, and at that point the level still showed no sign of running out of steam. By then, I was longing for the only thing that House of Cockroach does better: a timer that counts down to the end of the level. As it stood, although House of Spice had been an inoffensive (if not actually very fun) experience at the outset, by the time a flying seahorse finally blue balled me to death, my demise was a welcome relief. House of Cockroach: Good graphics for an Xbox indie title, but vomit-beckoningly tedious to play. House of Spice: Just about passes for a servicable game in most respects, but wouldn’t be any fun for more than about a minute or two even without any obvious problems. As it is, the excruciatingly long levels, cursor camouflage woes and fundamental idiocy of designing a lightgun game that can never actually use a lightgun relegate it to ‘avoid only fractionally less diligently than its sibling’ status.